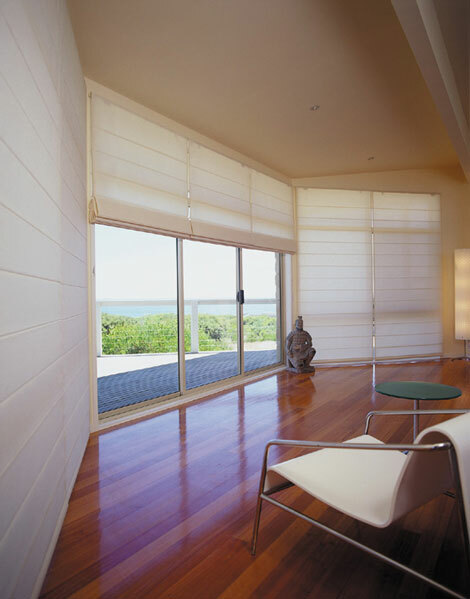 Roman blinds combine the features and operation of a blind with the elegance and warmth of a soft furnishing product. A wide choice of fabrics and designs allows you to dress them up for formal settings or create a relaxed feel for more casual living areas. They are ideal for long windows as they stack into a neat bunch at the head of the window to create their own pelmet structure. Roman blinds are one of the few blinds that can be installed into angled windows. The fabrics include block outs, translucent and sheers along with textiles made from natural fibres and yarns to create an exciting and blend of exclusive styles, see the fabric page. Controls see motorisation page or via chain mechanism.